Sometimes the biggest compliment I can get is when I see myself through my children’s eyes. I always have loved their drawings and their cute ways of showing me off as “Mommy”- often where I’m gardening in stick figure form outside of a house drawn in crayon. I love the ones of me holding their hands with the colorful backgrounds that speak volumes of the love ,I sense, they know I have for them. 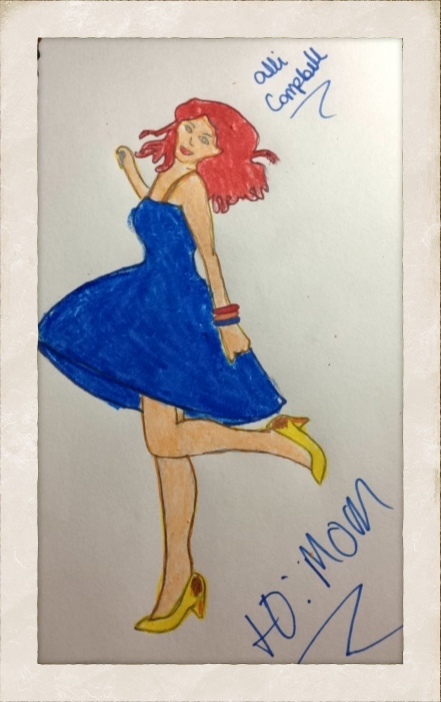 But recently my daughter drew me, and said she drew the “happy mom who got to be in a play.” She drew me fancy! Alli made my day. When she was done, I not only looked cute, I looked like a 1940’s version of me – happy and merry. I knew I had been happy while in the play, but I didn’t realize how much the kids noticed it till now. When you have a chance to do something you love, even if only dabbling in it, the effects can be far reaching. The kids have begun to ask me when I am going to be in a new play. “Dont you want to be in one again?” was one kid’s question, while another followed up with, “Yeah, when are you gonna be in something new that we can come see?” I do believe they like the mom who gets out and does fun things. So thanks, Alli girl, for letting me see myself through your eyes. I think I like the fancy look. Maybe I need to find a cute blue dress, because it looks marvelous on me! HA! Who knew I could look so amazing in blue crayon and pencil? It’s my new favorite look! You look like a model!!! Look at those legs. Wow! She took special care with those. Ha. She said she had to get my calves right. Even came to look at them. Such a sweet girl of mine! I would kill to draw like that!